Virgin America is starting service between San Francisco (SFO) and Chicago O'Hare (ORD) this week and I have the opportunity to fly on the inaugural flight to Chicago. 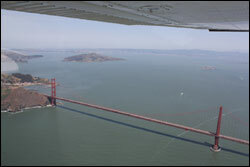 While in the Bay Area I decide it would be fun to take a Cessna 172 up and do a San Francisco Bay Aerial Tour. Earlier this week I reached out to Jason Miller who is a local CFI and also host of the Finer Points Podcast. Jason suggested we fly out of San Carlos Airport (KSQL) and fly North past San Francisco International Airport over the city and then tour the bay before coming back south along the Pacific coastline. After arriving commercially, I started the day with lunch at Sky Kitchen a restaurant just off the west side of the San Carlos airport. There I sat at a giant table in the middle of the restaurant surrounded by a group of pilots that meet for lunch nearly daily, some of them for more than 40 years. I enjoyed taking in the camaraderie and enjoying hearing some long tails. This is a new favorite $100 Hamburger destination. After lunch I met Jason at West Valley Flying Club. We pre-flighted the airport then launched to the North. Soon after take-off we received hand-off to the San Francisco Tower that allowed us to transition the San Francisco Class B Airspace. 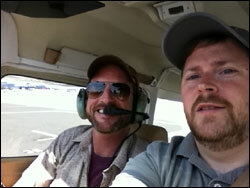 It was a thrill flying parallel to the commercial traffic landing on runway 28L and 28R. Just three hours before I had been in one of those tin cans. I much preferred being pilot in command over traveling like a sardine. Next we flew directly over San Francisco I did a lap around both the Golden Gate Bridge and Alcatraz. Having visited both the Golden Gate Bridge and Alcatraz before I loved seeing them from this new vantage point. Then we flew over Point Reyes National Seashore before turning south to fly low along the Pacific coastline. Heading south along the coast we paralleled scenic highway 1 as it winded its way down from San Francisco to Half Moon Bay. As we descended to 1,400 feet to stay below Class B Airspace NORCAL announced a traffic advisory at our 11 o'clock. The traffic was a 747 departing San Francisco International and quickly became no factor, but it was a thrill none the less to briefly share the airspace with a Boeing 747 about 500 feet above us and climb. Another enjoyable flightseeing experience in the book and one I highly recommend to all pilots. There are few icons as thrilling to fly by then the Golden Gate Bridge. Man, that IS some gorgeous scenery. Love that city, so much to see and do. I haven't been to San Fran since 2001 - I think I'm due to head back out there! Very cool that you got to fly the new VA route (how'd you manage that?) and fly w/Jason - I've been listening to his podcast off and on for years. Fantastic photos, I'm flying to San Francisco for the first time (from Incheon). Doubt if I'll get the same views as you guys..
People are now enthusiasticly running after the replica gucci shoes, after the brief but unforgettable period of sudden-hit recession. And you can be content with your purchasing limit easily and fit your budget with these cheap designer replica gucci shoes available online. The discounted and cheap designer replica gucci shoes are valued additions to your sports as well as fashion wardrobe. You can flaunt your fashion sense to your friends and never reveal the secret behind owning such immaculate looking replica gucci shoes. It is sure going to be the cause of envy amongst those ignorant few who have no clue how to attain economical alternatives like replica gucci shoes. Most of these cheap replica gucci shoes do not compromise too much on the quality since they would want repeat customers. The sloshed down rates are made possible due to the omission of original designer labels and service tax and other costs that are incurred from land-based designer gucci shoes retail stores. It is a win-win situation for both the manufacturer and the consumer. Hello, just wanted to mention, I enjoyed this post. It was funny. lunettes de vue oakley Keep on posting!